Harman Kardon's newest portable wireless speaker is a miniature version of its full-sized and not-so-portable $300 Esquire speaker, appropriately named the Esquire Mini. It's the most elegantly designed and best looking ultra-slim and ultra-portable high-end Bluetooth speaker you can buy for a surprisingly reasonable price...$150. With its unapologetic iPhone 5s-esque inspired design, the Esquire Mini is as premium as premium stereo Bluetooth speakers get. Like its larger Esquire brother, this beautifully made pocketable speaker is crafted from a unibody brushed aluminum construction with genuine leather backing for a luxurious feel and finish, a scratch-resistant ceramic-coated speaker grille and chamfered-edge finished aluminum detailing. The Esquire Mini's audio quality, which Harman Kardon says sounds impressively big for its size, comes from dual high-performance drivers and an enhanced bass port. Doesn't strike us as an impressive set of speaker hardware, but we will reserve our judgment until we can hear this thing in action and from up close and personal. But something tells us that since the Esquire Mini is only 5-inches wide by 3-inches high, weighs 238g and is less than an inch thick, it clearly was made to be as portable as it can possibly be. And not the Bose SoundLink Mini killer that we've all been looking for. Nonetheless, Harman Kardon's design and audio expertise certainly has us excited for what's to come when the Esquire Mini starts shipping in early December. Although it can be used to play music while sitting flat on its royal back side, the Esquire Mini's discrete metal kickstand lets you set it the perfect listening angle and sits flush against the leather backing when not in use. Completing its chic styling is the included leather hand strap that you can optionally attach to the side of the speaker to make it a little easier to pull out of that murse or purse of yours. Besides its dual speakers drivers, the Esquire Mini features a built-in 2,000mAh rechargeable battery providing enough juice to power the speaker on for up to 8 hours of wireless audio streaming whilst also allowing you to use its standard-sized USB port to charge your device using power from its internal 2,000mAh battery. Dual-microphones with noise-cancellation turn the Esquire Mini into a highly-portable, high-end speakerphone system. The Esquire Mini also has a battery status LED indicator meter on its side as well as on-board volume and speakerphone button controls, which Harman Kardon says are fully compatible with iOS and Android devices. And in addition to its USB charging output port, the Esquire Mini also features a standard 3.5mm audio input connection in case you'd like to use a non-Bluetooth audio source. 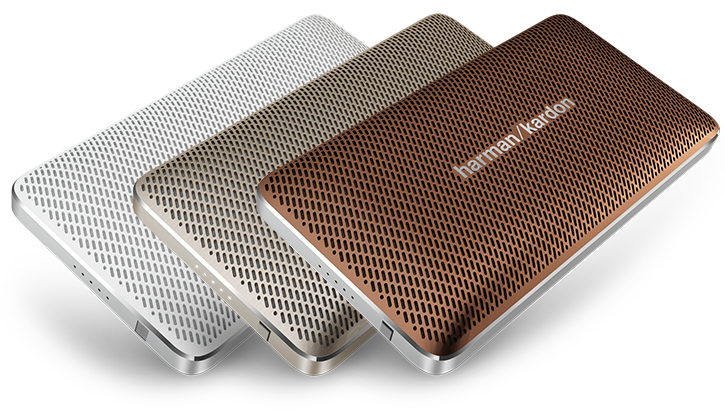 Customers can pre-order Harman Kardon's high-end Esquire Mini portable Bluetooth speaker starting today in a number of beautifully finished colorways including black and silver, champagne gold, white and copper for $150.